How did the olive ridley get its name? Olive ridley sea turtles are named after the olive colored shells that many turtles of this species have. Olive ridleys are similar to the Kemp’s ridley sea turtles. The two species are the smallest of all sea turtles. An adult olive ridley sea turtle can weigh up to 100 pounds and is 24-30 inches long. The hatchlings are about 1.5 inches long and weigh several ounces. The carapace varies from olive to grey-brown or grey-black. Hatchlings are greenish-black. The carapace of the olive ridley is usually a rounded heart-shape. Olive ridley sea turtles live primarily in the tropical regions of the Pacific, Indian, and Atlantic Oceans. They nest on the Pacific shores of the American tropics, as well as in the Indian Ocean and along the northeast coast of South America. It is unknown how long olive ridleys live, but like other sea turtles, they are likely long-lived. 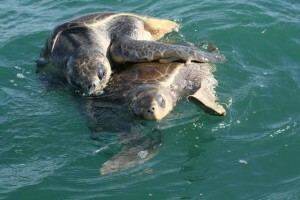 Olive ridley sea turtles eat crabs, shrimp, rock lobsters, and jellyfish. These make up their main diet in the western Atlantic and eastern Pacific Oceans. There are data indicating that olive ridleys in other parts of the world eat mainly algae. Arribada is the Spanish word for arrival. 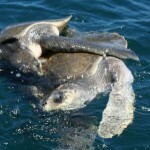 It is used to describe the mass nesting of olive ridley sea turtles. Nesting in large groups may be a defense against predators or a result of environmental factors influencing nesting. With many turtles coming ashore together and many nests subsequently hatching at the same time, it may help them to reduce predation. However, an arribada also makes the species susceptible to massive harvests by men, or natural disasters that could kill thousands of sea turtles at one time. 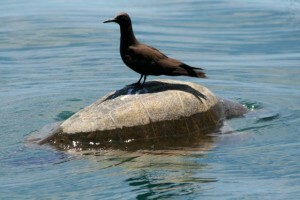 Scientists do not know exactly what conditions bring all the sea turtles ashore to nest. Possibilities include moon or tide phases, and climate or weather conditions. When and where do females lay their eggs? Female Olive ridley sea turtles are able to lay eggs between 10 and 15 years of age. A female olive ridley will nest at night 1-3 times per season. Female sea turtles always return to the beach where they were born, their natal beach, to lay their eggs. The olive ridley sea turtle nesting season ranges worldwide from June to December, with the peak period in September and October. There are several important arribada beaches along the Pacific coast of Mexico and Central America, and especially in Costa Rica. There are also important sites in the Indian Ocean and in the South Atlantic Ocean. Females clear the sand with their front flippers, dig an egg chamber with their rear flippers, lay 100-110 eggs, and then use their front flippers to cover the entire area with sand. The eggs incubate for approximately 55 days before they hatch. Hatchlings are much more susceptible to predators than adults. Crabs and raccoons feed on the hatchlings when they first emerge from their nests and fish and seabirds are a threat to hatchlings in the water. Very few hatchlings will survive to adulthood. Sharks are the principal predators of adult sea turtles, and their long flippers are especially vulnerable. Man is also a predator of the olive ridley turtle. Prior to the time when sea turtles were hunted for their meat, eggs and leather, it is estimated that there may have been as many as 10,000,000 olive ridleys in the Pacific Ocean. Today the population is greatly reduced from historical times. Humans have heavily exploited olive ridley sea turtles. They are killed for their meat and leather, and their eggs are collected off the beaches before they even hatch. The historic olive ridley fishery in Mexico was the largest turtle fishery in the world, with turtle products sold to Japan for high prices. Olive ridley sea turtles are often caught in shrimp trawls, longlines, and gill nets and drown because they cannot make it back up to the surface to breathe. Other problems include pollution and the loss of their nesting habitat as beaches become more developed. In the Eastern Tropical Pacific olive ridleys have been observed entangled in the debris that accumu- lates in weed lines. Sea turtles can also confuse trash and debris for food, and this can cause injury or even death. One surprising threat to sea turtles is the balloons that people let go. These balloons often float over the ocean before popping, and sea turtles can choke on the pieces of the balloon that fall into the water. What can you do to help sea turtles? It is possible for anyone to help support sea turtle conservation. You can help participate in beach cleanups or attend a public sea turtle walk. You can do a presentation on turtles for a class to raise awareness, adopt a turtle, or follow a sea turtle telemetry project. You can help just by remembering not to release balloons or throw trash into the ocean. You can help spread the word to your family and friends that sea turtles are an important part of our environment and should be protected. Costa Rica’s marine area reaches 580,000 km2, approximately 10 times larger than its land area of only 52,100 km2. The Costa Rican ocean generates countless biological, economical and social benefits and in its resources lays the future of the country. The Marino Ballena National Park and the surrounding areas of Cano Island Biological Reserve and front bays of the entire Osa Peninsula are beautiful marine areas where locals and visitors alike can experience whales, dolphins, sea turtles, marine birds, colorful fish and amazing coral reefs. Whales are large, magnificent, intelligent, aquatic mammals. They breathe air through blowholes into lungs (unlike fish who breathe using gills). 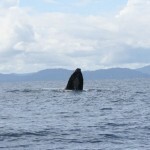 Whales have sleek, streamlined bodies that move easily through the water. They are the only mammals, other than manatees (seacows), that live their entire lives in the water, and the only mammals that have adapted to life in the open oceans. Scientists believe that early whales actually walked the earth. The theory, supported by recent fossil finds in the foothills of the Himalayas, is that about 53.5 million years ago, whales were amphibious. They originated as land mammals, and gradually ventured into the water in search of food. They fed on fresh and saltwater fish. Eventually, they lost their legs and nostrils, and became the creatures we know today. The Humpback Whale, Pilot Whale, Bryde’s, and False Orca are just some of the whales that visit the Marino Ballena National Park and the surrounding areas of Cano Island Biological Reserve and front bays of the entire Osa Peninsula. 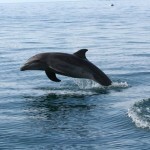 Dolphins are marine mammals that are closely related to whales and porpoises. There are almost forty species of dolphin in seventeen genera. They vary in size from 1.2 metres (4 ft) and 40 kilograms (88 lb), up to 9.5 m (30 ft) and ten tonnes. They are found worldwide, mostly in the shallower seas of the continental shelves, and are carnivores, mostly eating fish and squid. The family Delphinidae is the largest in the Cetaceans, and relatively recent: dolphins evolved about ten million years ago, during the Miocene. Dolphins are considered to be amongst the most intelligent of animals and their often-friendly appearance and seemingly playful attitude have made them popular in human culture. The Bottlenose Dolphin, Pan-Tropical Spotted Dolphin, Common Dolphin and Spinner Dolphin are permanent residents and can be generally observed year round breeding and feeding in the warm tropical waters of the Marino Ballena National Park, Cano Island Biological Reserve and Osa Peninsula. Sea turtles are large, air-breathing reptiles that inhabit tropical and subtropical seas throughout the world. Their shells consist of an upper part (carapace) and a lower section (plastron). Hard scales (or scutes) cover all but the leatherback, and the number and arrangement of these scutes can be used to determine the species. Sea turtles come in many different sizes, shapes and colors and the most common sea turtles in the South Pacific, Osa Peninsula of Costa Rica are the Green Sea turtles, Hawksbill turtles and Olive Ridley turtles.